The Sean Dowhaniuk Group at the Hamilton Audio Visual Node. Photo by Aaron Hutchinson. I’m going to be honest with you: the Sean Dowhaniuk Group is one of my favourite acts at this year’s festival. I don’t mean to pick favourites, and I’m being honest when I say that every show in our lineup offers something unique and exciting. But I’ve had the opportunity to see the Sean Dowhaniuk Group in multiple configurations over the last couple years and the music is always exhilarating, thought-provoking and fresh. So if you like you can chalk it up to habit, but this is one show I’m particularly excited about. 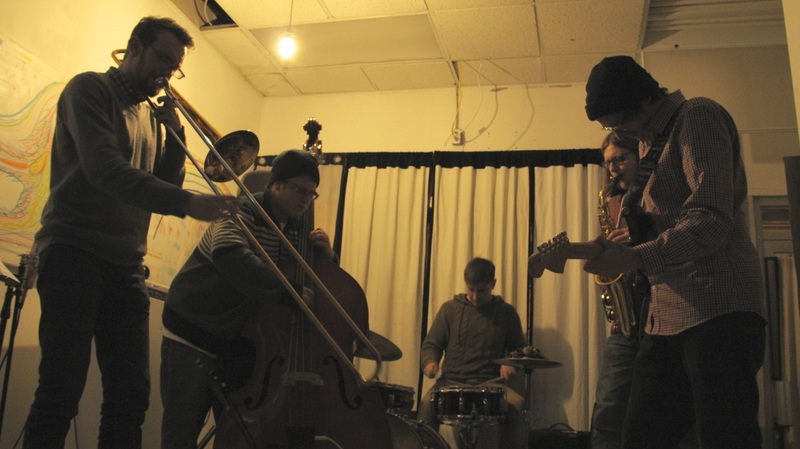 The Sean Dowhaniuk Group, featuring Mike Rajna on drums, Riley Keller on alto sax, Josh Smiley on piano and Ethan Tilbury on bass, perform at Artword Artbar with the Aaron Zukewich Trio on October 17th. The show starts at 8pm, tickets are $10/$5 for students and reservations can be made by emailing artword@artword.net.